A few days ago I met Eitaro and Tamae originally from Osaka. Common friends Boon and Cheryl Lim brought me over to their apartment to bid them good bye. Eitaro and Tamae have been living in Singapore enriching lives through their artistic gifts. After several years, they are now relocating to Okinawa. Back in 2001, I went to these beautiful islands together with Kenny Mitchell, a DJ who came alongside locals to learn of the existential conflict Okinawans faced. 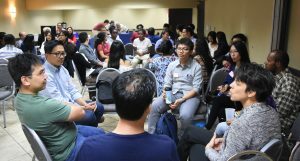 We were encouraged as we connected well and together inspired local Okinawans on how they could make a difference. I first heard of these Japanese islands through the stories of a World War II veteran who was stationed there. He told stories of difficult battles and scenarios. Nolan McDaniel was my kids’ grandfather and he was a big man with a bigger heart. Like many groups all over the world, their own heritage, culture and language had been swallowed up by a much bigger nation. The Okinawans’ case is further complicated by many years of US rule (until 1975). Today, they face a fractured existence defined by allegiance to their national identity as Japanese while at the same time recalling the rich inheritance from their ancestors, all in a world saturated with American influence. A few days earlier as I went back to the US, my plane flew right over Okinawa and I was stirred as I recalled my visit there. From 30,000 feet in the air, I took a picture. Little did I know then how meeting a Japanese couple in Singapore would be woven with my past there. 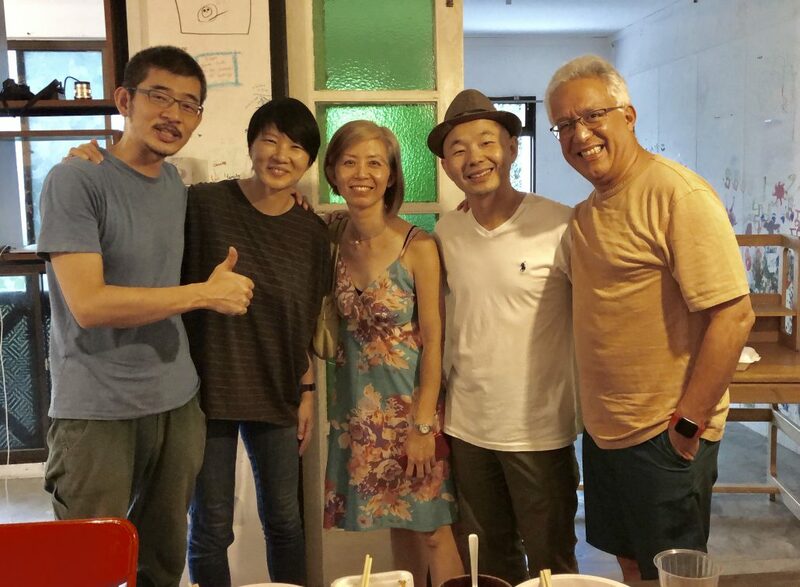 Eitaro and Tamae plan to establish themselves in Okinawa and bless the people there with their artistic gifts, allowing normally introspective people to express themselves in fresh ways. Their theme is Love and art is their medium. Dr. Carlos Bravo knew what fate awaited him. 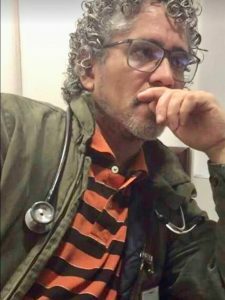 Sebin (Venezuelan Secret Service) had been harassing him for broadcasting videos and commenting on the situation at the University Hospital, one of many hospitals whose capacity to serve patients has effectively been stripped by a government who does not care for the needs of its people. The funds required to purchase medicines have been depleted, largely as a result of widespread corruption. At the same time, citing “outside interference”, humanitarian aid has not been allowed into the country. The remaining lifeline is individual parcels of the most elemental of resources sent by family and friends from outside the country. Dialysis patients are not able to have the routine procedures needed to preserve their lives. HIV/AIDS patients long ago stopped receiving their needed medicines. Cancer sufferers have no access to any kind of treatment. People regularly utilize social media to request antibiotics, other basic medicines, and even ointments. On average last year, 31 Venezuelan infants died every day. Many were victims of diarrhea, bacterial infections, and other diseases that, according to the local pediatric society, could have been prevented or easily treated. “There are vaccines and antibiotics available, but Venezuela is so lacking that these illnesses are coming back,” said Dr. Huniades Urbina, president of the Venezuelan Society of Childhood and Pediatrics. Deaths of babies younger than one year jumped to 30% in Venezuela in 2016, according to the last available government figures. That is a stark contrast to declines across the rest of Latin America. The government has long since stopped releasing data on all basic metrics of life in the country. No one is able to know the facts – from inflation and hard currency reserves to causes of death. On October 20, Pastor Marcelo Coronel, leader of the Merida (main city in the Andes region) Pastors Fellowship learned that one of his church’s members had been detained by the security services. She had with her two boxes of medical supplies to distribute among the needy. She was accused of trafficking and taken into custody. Pastor Coronel voluntarily went to speak on behalf of his church member and has now been kept in jail for over a week. There is a war against anyone trying to help the people in Venezuela. This crisis is what drove Dr. Carlos Bravo to give all he had to serve at the hospital where he endeavored to preserve life. Starting as a nurse, then an assistant in surgeries, then a researcher in basic sciences and finally as a general surgeon, he became one of the best in the country. Dr. Bravo knew that the Sebin basements were waiting for him because they had already called him to tell him that they were waiting outside the hospital to take him away. Terror and the panic destabilized him, for he was claustrophobic and he feared the darkness. Knowing that Sebin would leave him in the basements without light, he injected himself with a solution that ended his life. Venezuela has lost a servant who loved his people till the end. The country’s human capital continues to be eroded as those who choose to stay and serve are slowly being decimated by a government whose intent is to create a North Korea-like pariah state… even as North Korea starts to reverse its decades-long failed policies. Yesterday on my flight out of Athens, I was asked what was I doing there. I had a chance to tell this local expat about the work Philemon and the StreetLights team is doing serving refugees. She was surprised to hear that refugees were being cared for by locals! Once again, I found that there is a huge misconception between reality and perception. With regular reports on the negative refugee experiences, it’s no wonder people only know of the bad news. There is no doubt that 65 million refugees represent the one of the most significant challenges the global community faces today. Yet, they also represent new possibilities. For example, the elderly who are often alone can be served by properly trained newcomers who mostly come from cultures where their grandparents are treated with veneration and great care. 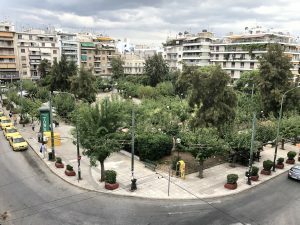 The Streetlights team has been serving in Kypseli, the largest refugee community in Athens. They have gained the support of the local community as they watch them teach the refugees Greek and also English. They have encouraged their own kids to join the many games they play in the square. Instead of fear of hijabs and burkas, of new faces and languages, of competitors and potential enemies, everyone feels relaxed and content. Something very special is happening here. Philemon’s passion to welcome and help integrate these newcomers has inspired a number of young people to come and work alongside him. During this short visit, I got to know Spiri, a woman on fire to get things done and get them done well. She manages hundreds of details necessary to meet needs and motivate workers to do their best. Her capacity to motivate others is remarkable. I also spent time with Stefan Vass, 17, who came as a 5 year old to Greece from Romania and Aris Nemir, 16, who was born and raised right in Kypseli. Both are high school seniors, rugby players and they do it all with speed and joy! These kids humbled me with their compassion and love for the new kids. All the action takes place at night when the temperatures dip from the 35°C we had during the day. As we walked around, I met locals who warmly greeted Philemon offering encouragement and practical ways they wanted to contribute. Two days before I left, the skies over Athens grew brown. Strong winds just 20 miles away had spread fires, burning 1000 homes and causing the loss of at least 80 with hundreds injured. The speed with which the flames grew and spread left everyone astonished. 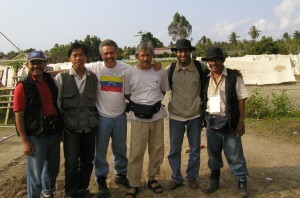 Philemon and his team went immediately into action contacting authorities offering their services to the kids affected. They now await confirmation to help kids in an orphanage near the devastated area among several possibilities. I made a commitment to help them raise funds to mobilize people and equipment to the affected area. Will you join us and encourage StreetLights to continue to help make a dent into the mega need refugees represent now? From the most remote regions of Indonesia, they have come to the USA to prepare themselves to bring change to their communities. Populated by tribal groups, Papua is home to around 312 different tribes, including some un-contacted peoples. The ancient cultures of Papua have remained disconnected from all forms of modern progress. This isolation has given them a sense of identity and autonomy which would be challenged at every level as outsiders began to approach them. Under the jurisdiction of Indonesia since 1969, Papua lies hundreds of miles to the east of Jakarta. It is the last in the string of Indonesian islands. 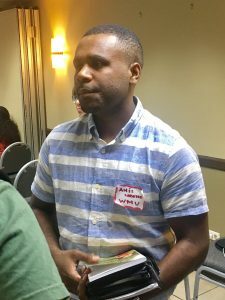 In recent years a new generation of Papuans has emerged who are committed to their people and land and preparing themselves to bring 21st century leadership to their communities. 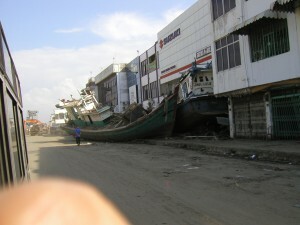 Veronica grew up in Sentani. She lost her father at a very early age and her Mom worked very hard to support her and her other five siblings. She worked at an airfield and began to learn about airplanes and airport management. 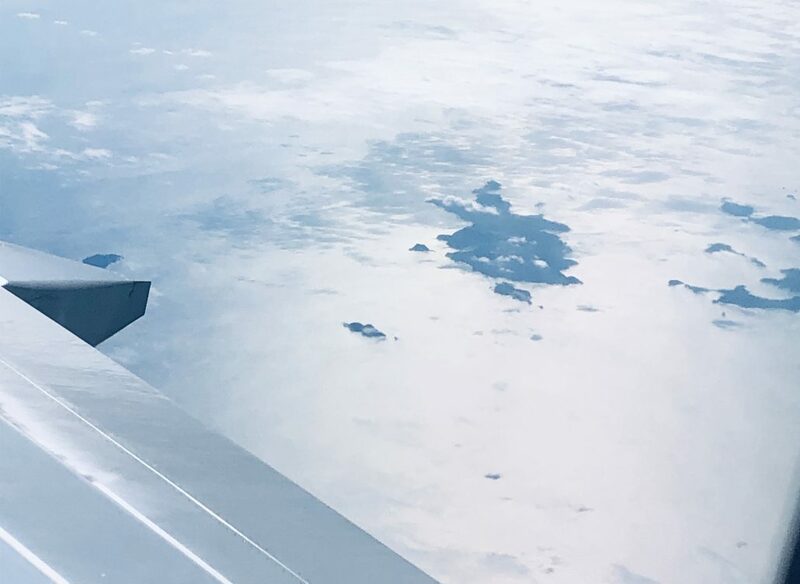 Today, she is studying Business Management and wants to continue to study Aviation Administration management for a masters degree and dreams of providing air transport to remote areas of the vast island. Anis comes from the remote Highlands, an area surrounded by 3,000 meter high mountains: the only place where one can find snow in Indonesia. He is studying Aviation and Political Sciences and dreams of creating transportation systems that will ease commerce lowering the prices of goods and services. These two, among the 14 other Papuan students, are preparing themselves to make a difference in their communities. The enthusiasm and commitment to their people is evident in the way their plans were explained. 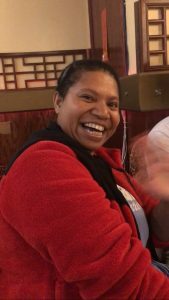 FICA (Fellowship of Indonesian Christians in America) in an organization dedicated to bring students, in this case – Papuans and mostly Chinese-Indonesians – to work together represents a major step forward in forging a better future for the nation. The people of Papua feel colonized by Indonesia. The political and economic injustices that have ensued as a result of being ruled by outsiders have nurtured anger and resentment. The attempts by the central government to be of assistance and encourage development have constantly been marred by the corruption that is endemic in all governmental endeavors. In the mean time, socially, Papua is unraveling. People coming to the urbanized centers from their remote villages experience such clash of civilizations that it overwhelms them. The rates of HIV-AIDS, drug abuse, and promiscuity among young people are among the highest of the nation. A whole generation of young people is being lost. Unfortunately, the traditional safety nets no longer hold society together. In these uncharted waters there are no road maps that can assure a stable and prosperous future for the people of Papua. This 24th annual FICA gathering represents a fresh wind of hope for the people of Papua. By bringing together Indonesians from diverse backgrounds FICA is laying a great foundation for the future. 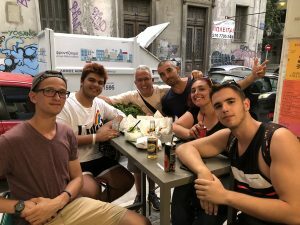 I experienced this firsthand as students interacted with each other, both in discussion groups as well as simply sightseeing at night in downtown Chicago. The plans being crafted between students in the USA will define working partnerships that could last a lifetime, representing real hope for unity and progress. For the first time in 50 years the people of Jakarta have installed a new Governor rejecting discrimination on the basis of religion and instad focusing on proven effectiveness. Those who thrive in hate and discrimination are always a minority. The citizens of Jakarta have choosen the better way. As the new President of Indonesia establishes his style and moves forward with his agenda for the nation, a new awareness is emerging that the country has a unique role to play in todays emerging nations. As the largest Muslim nation, democracy has taken root in Indonesia and President Jokowi who comes from the working class is showing that good governance is indeed possible. This recent piece by the editorial team of the New York Times makes the case from the perspective of the US. [dropcap] C [/dropcap]ongratulations to Pak Joko Widodo (53), newly installed as President of Indonesia! I first went to Indonesia in 1998 a few days after Suharto, dictator for 31 years, was deposed. The city of Jakarta was in shambles as many were killed in the confrontation between the military and the civilians who wanted democratic change. Since then, four presidents have sought to bring prosperity and change to the nation with varying degrees of success. These well meaning leaders have all helped the established interests of those who have profited from political connections and corruption. Their interests have mostly ignored the poor and have severely limited the development of the nation. In the meantime, a man coming from among the common people was emerging as a leader interested in efficiency, honesty and real change for the nation. Enter Jokowi, a man of unparalleled contrasts. A furniture salesman who was impressed with the social justice he saw in Europe and wanted the same for his people. He decided to enter politics without the support of any of the existing political parties and became the mayor of his hometown Solo in Central Java. After a very successful tenure, he decided to run for leadership of the capital city Jakarta. He surprised everyone by choosing as his running mate Ahok, a Chinese Christian. 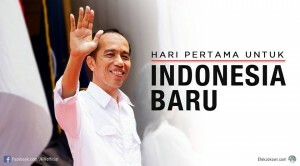 He won the elections and their leadership has positively changed Jakarta in unprecedented ways. Today (yesterday in Indonesia) starts a new day for the nation. 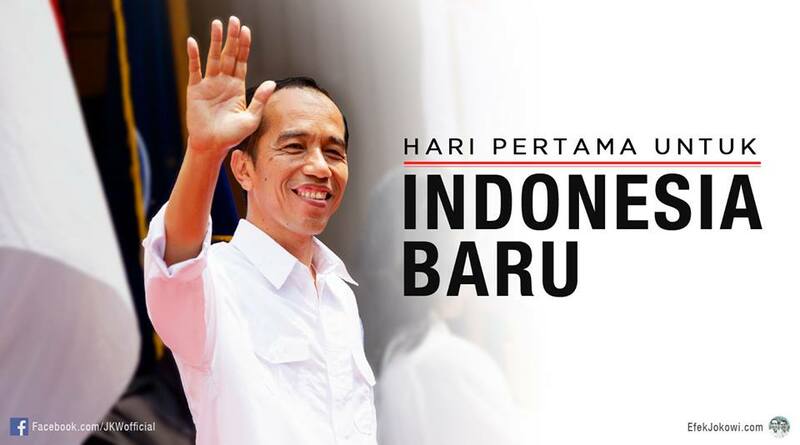 Jokowi faces significant economic, social and political challenges but he faces them with the calm assurance that as long as people understand the issues they will work with him to improve the lives of 260 million Indonesians. He has offered to set up a one-stop shop for investors to speed up business permits within six months, gradually cut fuel subsidies within three years, move tax collection online and prioritize maritime logistics and mass public transportation. As President elect Joko Widodo awaits his inauguration next October 20 he has been laying out the ground rules for his administration. In his usual style, he is talking to the common people in the villages, street markets, sports halls as well as diplomatic representatives and visiting business leaders. 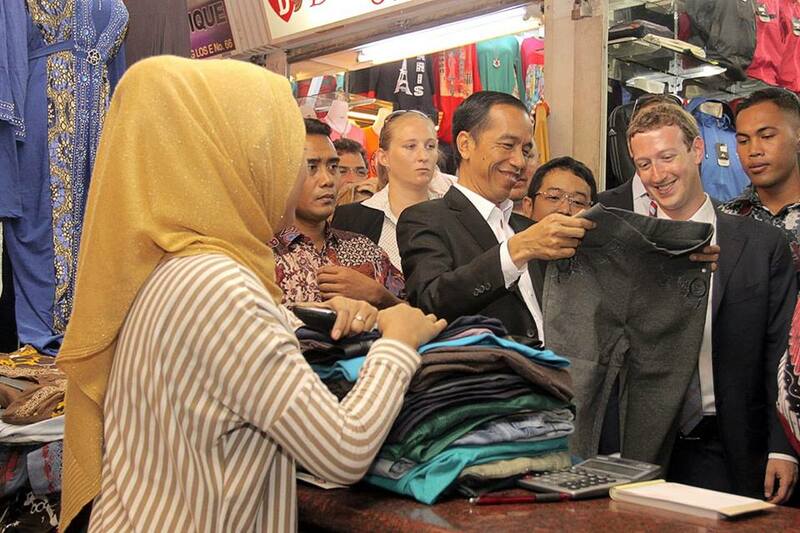 Jokowi took Mark to Tanah Abang a traditional market. There, he got him pair of pants. Yesterday, Mark Zukerberg, CEO and founder of Facebook was in Jakarta for the Internet Developers Summit. Indonesians are hooked on Facebook. There are 69 million Facebook users out of a population of 251 million (estimate 2014). Making the country the fourth largest FB user in the world, 1 in 4 locals are FB active! Jokowi, as the new President is affectionally known, wants to empower all Indonesians through education and sustainable business practices and he is convinced that the Internet plays a key role in that process. Zukerberg’s initiative internet.org has been specifically designed to make that possible. He describes it as a global partnership dedicated to making affordable internet access available to the two-thirds of the world not yet connected by making information available to more people everywhere and by providing more affordable devices, Mark’s initiative is at the forefront of empowering the people in the village at every level. Once again young people are making their voices heard at the global stage. While the implications of the youth led Arab Spring Movement are still being sorted in several nations, young people in Hong Kong are standing up to challenge the seemingly absolute power of Beijing. Joshua Wong, who turned 18 yesterday has emerged as one the iconic faces of the Hong Kong Occupy Movement. The skinny young man started his leadership career a couple of years ago when new rules were drafted to teach a new form of Patriotism. He disagreed with the decision and launched the Scholastics Movement designed to oppose changes to the curriculum. The government rescinded it’s plans and Joshua and his friends when back to their classrooms. This time, however the stakes are much higher for the protests are directed at decisions made at the highest levels of government of both Hong Kong and China. Joshua was arrested for 40 hours and his detention stirred a response which has brought tens of thousands blocking traffic in one of the worlds most important financial hubs. 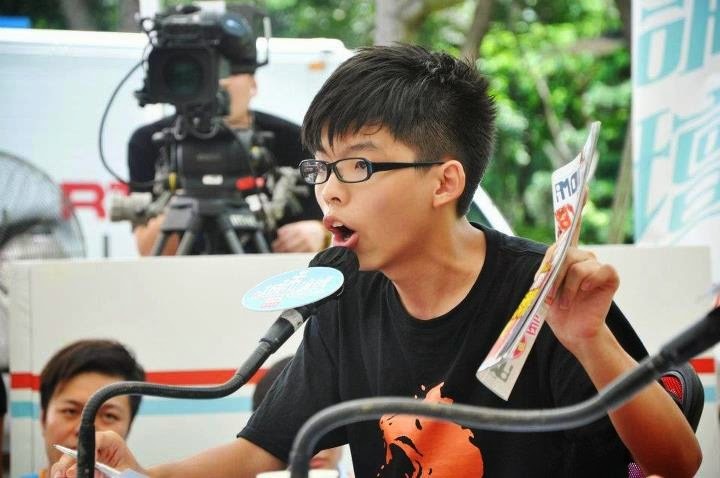 However, Joshua is just but one of the unprecedented number of people who have taken peacefully and in remarkable order to the streets demanding that the leaders of the nation live up to the commitments made when Hong Kong was returned to China in 1997… the year Joshua was born. In reality the chances of their success seem quite limited, after all soldiers of the People’s Liberation Army (PLA) are standing nearby ready to follow orders and fully capable to eliminating any dissent. To understand the reckless behavior of the normally obedient and compliant young people of Hong Kong one must realize that they are standing up for the democratic process promised under the ideal of “One nation, two systems”. This was a solemn agreement signed by the highest representatives of both China and Great Britain. Secondly, it is important to recognize that in a very small nation with one of the highest population densities only the full freedoms of a democratic process would afford equal opportunities to the majority. Besides, even if they were allowed to vote for their chosen candidates, China would retain all power as Hong Kong can not make foreign policy decisions and does not have an army. Thirdly and perhaps of equal importance is the faith which drives Joshua and his friends. As followers of the way of Jesus, they look to the future full of hope and expectation. Furthermore they are clearly motivated by a unparalleled commitment to love their neighbors as they love themselves. This is what explains their rejection of violence as a tool and their unwavering respect for authority. At a time of increasing political apathy these youthful protestors of Hong Kong are presenting us with a great challenge and a practical model to let our voices be heard. The question are, are we listening? And will we take steps to also respond to the injustices in our communities?